September, and thus a new academic year, is quickly approaching. This year I will be teaching POLS 250 again. This is a full-year course (approx. 230 students) on the history of political thought. It is a required course for all our Political Studies majors here at Queen's University. We start with Plato and end with Marx. Should be lots of fun. 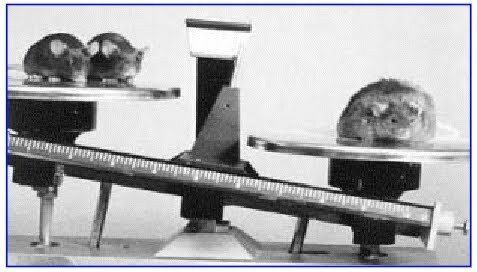 (4) The Myth of "Homo Primaeva"
The latest issue of PNAS has this study on the impact of calorie restriction (CR) and exercise on the nervous system of aging mice. ....The connections between your nerves and muscle deteriorate with age--a phenomenon that may help explain the serious loss of muscle that often strikes old people. New evidence suggests that caloric restriction--a nutritionally complete but low-calorie diet--could help prevent these changes. According to a study published this week in the Proceedings of the National Academy of Sciences, a very-low-calorie diet, and to a lesser extent exercise, can prevent or slow some aspects of muscle decline in aging mice. ....The findings are among the first to show that caloric restriction has a robust effect on the nervous system, which has been a matter of debate. "This paper demonstrates the protective effect of dietary restriction on muscle and the neurons that regulate muscle function," says Mobbs. "It's one of the most convincing papers I have seen demonstrating a protective effect of dietary restriction in neural function." Those who are disinclined to diet for their whole lives still have hope, however. Mice that exercised for a month in old age also had healthier neuromuscular junctions, though the findings weren't as significant as those for caloric restriction. "Just a month of exercise actually seemed to reverse the course of the downward spiral," says Lichtman. "If there were ever two scientists who did not want to hear this result, it's us," says Lichtman, of himself and Sanes. "We don't love to exercise, and I find it real torture to starve myself." Because few people want to or are able to maintain a severely restricted diet, scientists and drug developers are searching for molecules that can mimic these health-boosting effects. From the time I was a young child I have always been fascinated by salamanders. They have the ability to regrow their tails and limbs. Why don't mammals have the capacity to do this? Could it be possible for humans to develop these powers? Imagine how incredible it would be if it were possible for a child to re-grow an arm or leg they lost in an accident. 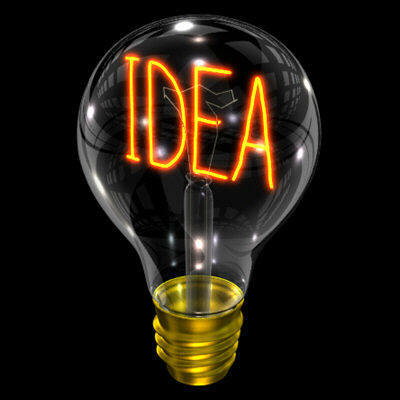 Or for a person to re-grown healthy cells in a damaged heart or brain. Sound like science fiction? Maybe not. This NatureNews story reports the latest findings from this study that suggests that the prospect of regenerative medicine is much closer than you might think. Newts and salamanders have brilliant personal-injury insurance: lose a tail or leg, and another grows in its place, good as new. Now, researchers in the United States say that they've found a way to recreate this ability in mice, opening the door to the possibility of regenerating damaged tissue in humans. Compared with these lower vertebrates' ability to regrow missing limbs, humans and other mammals "are pretty pathetic", says Helen Blau, a regenerative biologist at Stanford University School of Medicine in Stanford, California, and the study's lead author1. "We can regenerate our livers, but not much else," she says. So the burning question for researchers has been: what do these amphibians have that we lack? ....The researchers homed in on a tumour-suppressor gene called Arf that is present in mammals but not in regenerating vertebrates. Using a gene-silencing technique called RNA interference to temporarily knock down both Arf and Rb in cultured mouse muscle cells, they found that the treated cells re-entered the cell cycle and began proliferating. When the genes' activities were restored, the cells returned to their differentiated state. Newly generated muscle cells transplanted into living mice were able to integrate into the animals' muscle tissue. 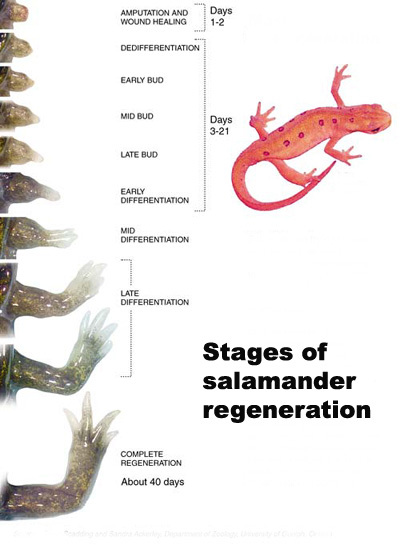 An outstanding biological question is why tissue regeneration in mammals is limited, whereas urodele amphibians and teleost fish regenerate major structures, largely by cell cycle reentry. Upon inactivation of Rb, proliferation of postmitotic urodele skeletal muscle is induced, whereas in mammalian muscle this mechanism does not exist. We postulated that a tumor suppressor present in mammals but absent in regenerative vertebrates, the Ink4a product ARF (alternative reading frame), is a regeneration suppressor. Concomitant inactivation of Arf and Rb led to mammalian muscle cell cycle reentry, loss of differentiation properties, and upregulation of cytokinetic machinery. Single postmitotic myocytes were isolated by laser micro-dissection-catapulting, and transient suppression of Arf and Rb yielded myoblast colonies that retained the ability to differentiate and fuse into myofibers upon transplantation in vivo. These results show that differentiation of mammalian cells is reversed by inactivation of Arf and Rb and support the hypothesis that Arf evolved at the expense of regeneration.